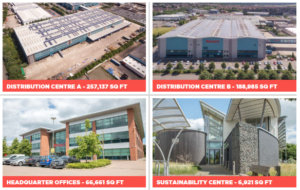 Four individual buildings totalling 519,704 sq ft / 48,282 sq m plus expansion/development land of 3.15 acres / 1.27 ha available individually or as a whole. The property is situated on Spa Park, a 35 acre business park, approximately 1.5 miles south of Leamington Spa Town Centre. 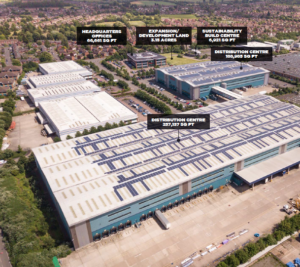 The property fronts Harrison Way, which adjoins the B4087 Tachbrook Road, which in turn provides direct access to Junction 13 of the M40 motorway. TENURE The property is available to let on a new full repairing and insuring lease on terms to be agreed. Alternatively the property is available for sale with vacant possession on a freehold basis. GUIDE PRICE / RENTAL Available on application. RATING ASSESSMENT Warehouse & Premises: Rateable Value (2017): £2,190,000. DATA ROOM Access to the data room can be provided upon application. SERVICES All mains services are connected to the property. Solar panels are fitted to both NDC A & B and have the capacity to produce 2MW, or 30% of the power supply for the site. However they are not currently turned on. Further information is available within the data room. ENERGY PERFORMANCE CERTIFICATE Building A – B (41) Building B – B (32) Building C – C (51) Sustainability Build Centre – D (97) VAT All prices quoted are exclusive of VAT, which may be chargeable.